Thank You For My Slipperies Aunt Shirley!! On Valentine's Day she sent a large care package and one of the gifts for Katie was a pair of Dora Slippers which she calls her slipperies. Katie loves them soooo much and every time she wears them she always tells us that her Aunt Shirley gave them to her. Tonight she had just gotten out of the bath (thus the wet hair) and she was talking about Aunt Shirley again while wearing her slippers so this time I ran for my video camera and got the following on tape. Aunt Shirley, I hope that you enjoy this as much as we love you. As we approach four months since we adopted Ethan in China I cannot help but look back to guage how far he has come. I really wanted to do this; not only so we that we could tell you all about how is he is doing now but so that we can see it more clearly ourselves. When we received Ethan, he could not stand up for very long without being wobbly and fall to the ground. Now he is walking well and even running. He does not fall to the ground at all unless he loses balance or trips. When we were in China and would have both kiddos on the bed with us to play he would try to crawl towards us and just face plant immediately. It was the saddest thing. He could not even turn over on his own. He still has a way to go with his balance and strength but he sure has come a long way. He can do everything that he could not in China. Another huge problem that we detected is that Ethan did not have a startle reflex which is the protective reflex which throws out your arms and hands instinctively to break your fall. His was lost during the long months in his orphanage and in the hospital where he was left on his back in the crib far too long. The occupational therapist is helping us to retrain his brain to execute this lifesaving instinct. He is making progress with this as well. The OT is thrilled with his progress and feels that he should be done with therapy in a couple of months and that anything further that he may need we can accomplish at home. Ethan had no language whatsoever. He would sometimes scream out in a very primitive way to get his needs met. That is if he screamed at all. He would often cry or just stay mute and not even ask. He would be sadly satisfied to sit where ever you placed him and watch the world. Now, that is absolutely not the case. He is our little Double M (mischief man) and he is constantly looking for ways both verbally and non verbally to make his needs known. He is in speech therapy twice a week and his vocabulary is getting better and better. He can put two words together. His fav is "all done" when he is finished with something he is tired of and just this morning as he was leaving the house with Marc he ran to me to say goodbye and as he walked out the door he looked back and said the three sweetest words a mother can hear "I Love You" I screamed with joy. He also knows several sign language signs to supplement his verbal repertoire. His receptive language is amazing and has been from very early on. He is smart as a tack and is very observant. He watches everything that we do so we have to be very careful what we do in front of him lest he go back and get himself into trouble. Eating was the area that we were most concerned about when we brought him home and that is saying a lot considering that there were many areas of concern. When we received him at 2.4 years old he was on five bottles of formula a day and even though the orphanage director told us that he was eating mashed foods there was certainly no evidence of it. He acted like solid food in any form were completely foreign to him other than a cracker like cookie that he basically mouthed upon us receiving him. His teeth and palate showed the damage of a bottle being propped in his mouth much of the time. Ethan was diagnosed upon our return as failure to thrive and we immediately sought help both privately through an Occupational Therapist (OT) that specialized in sensory integration disorder and through the county early intervention program. At first we supplemented the formula with Pediasure and cereal to maintain his low weight. We began to use the strategies that were given to us by the OT and the early intervention personnel to get him to eat and we came up with a few of our own and I am proud to report that Ethan is doing amazingly well. We had him off the bottle within 6 weeks and started him at stage one baby foods; fast forward to the present where he is eating three squares a day, begs us for "Nacks" (snacks), uses a sippy cup along with a regular cup at meal time and has gained about 4 lbs. If you can believe it he is out-eating his sister who was an amazing eater before Ethan's arrival. We are having to deal with the dynamic of her jealousy over the huge amount of attention that his eating focused on him. Now we are having to baby her a bit to get her to eat which is just fine with us. They are babies for such a short time and this regression is definitely an area that we can help her with. Socially, he was extremely delayed. He did not seem to have had much contact with other children in any type of playful way. When Katie or a play object would come close to him he would kick at her or the item almost as if he was testing it's relation to himself. That was a very scary reaction for us to see and I must admit that I felt quite overwhelmed when I experienced it. He also was a big crier and he still is to some extent when he does not get his way or he has something taken from him. His cry is very sad and we think that this was the only way that he got anything at all in the orphanage. We also think that it may have worked against him in some situations as most likely his caretakers tired of the cries and let him cry alone. This was the thoughts of our pediatrician who is from China and deals with many children who are internationally adopted. She stated that he had the kind of cry that would make a caretaker who did not love him want to walk away. Way too sad for us to think about. He now reacts to his environment like any other toddler although he is still socially a few months behind his age. That will just take time and interaction with other children which we find lots of opportunities to do with him. Also, since Katie is in preschool for three mornings a week we use that time to give him lots of one on one attention. He goes to Music Together once a week, has four therapies a week and lots of play dates with friends children. He is naturally a very social little boy. He is not shy in the least bit and is very happy go lucky. His health is improving along with his overall development. He is subject to getting respiratory ailments a bit quicker than the rest of us due to his underdeveloped trachea. Other than that we feel very fortunate that his heart was repaired so well and that he should live a completely normal life. We are still working on helping him adjust to life in our crazy family. He is quite attached and loving with both Marc and I although he is still a bit too social to my liking with others and does not have much, if any stranger anxiety. Sounds great to the layperson but to one that understands attachment we still have a ways to go. I know that it is a process and I am much more comfortable with how long true attachment really takes than I was the first time around with Katie. Ethan is also becoming very attached to his sister and brother. As far as Katie goes I am very happy to report that although they squabble like any two 2 year olds would they are quite devoted to each other and do not like it when they are apart for too long. Katie loves her alone time at school but talks constantly to the teachers about Ethan. That just melts our hearts and makes all of the tough and challenging moments so worthwhile. Ethan is a very strong and resilient child and the addition of him into our family has completed us. We look forward to the months and years ahead as we see Ethan and Katie grow to be productive members of society and reach whatever their potential is just as their brother Justin is now doing. Isn't that what all of us really want for our children? If you remember back to my last post, I told you about Ethan climbing out of his crib and that we were going to have to put the toddler rail on quickly so we were going to place it on expedited special order. Well, we did do that and expected the toddler rail in on Monday morning. There were lots of tears while I tried to apply ice to his face as Katie looked on quietly. I told them both how upset and disappointed I was (she understands and he does not or at least we think he does not ). Marc had to take the crib front rail off and put the mattress on the floor for the weekend until we can get the rail on Monday. Right now all I can say is.....I would just really like a dull moment!! Yes, we can safely say the physical therapy is working. The guard rail for the toddler bed was already on special order and now as you can imagine we asked that it please be expedited!! Marc was gone this past week on a business trip and it was my first time alone with the dynamic duo. It was a wonderful and absolutely, positively exhausting week. I think the thing that made it so exhausting is that when the two of them team up they are amazingly naughty. Every time I turn around they are either somewhere they are not supposed to be, such as balancing on the back of the couch like it is a balance beam or taking every DVD case out of the cabinet and then every disc out of each...oh that is so much fun to clean up! They have moments where they are fighting over toys like any normal two year olds and then are more and more huge blocks of time where they play happily with each other. That is so gratifying but I must say that by the end of each day that I am so bone weary that I could just moan out loud and I sometimes do. There was one day where I put Katie into time out and Ethan happened to walk fairly close to her. She yelled at him "No Ethan, I am in time out first and you cannot go into time out!!" How funny is that?! Valentines day was lots of fun as they really got into it. Grandma and some friends sent them Valentines in the mail and Nana brought them Candy and presents. I brought them candy as well and boy were they all about that candy; Ethan especially!! That evening we made Daddy homemade valentines for when her got home and they really got into that. Marc was supposed to be coming home on the Red Eye from Vegas Friday am. At 2:45 am I received a phone call from him saying "Lori, I am not coming home." I was so fuzzy brained from being woken up at that time of night that I thought he meant he was never coming home and I started freaking out... He meant that he was bumped from the flight but I was busy having a panic attack at the thought that he was leaving me to be a single mother to two 2 years olds!! Now, for all of you that know Marc you are laughing at me right now because the thought of him staying in Vegas and never coming home is totally ludicrous but I was in an exhausted state and this is what I thought..LOL. Anyway, he proceeded to talk me off the cliff while I gathered my wits about me and then he told me that he was trying to make arrangements to come home the following day. That did not sit well with me either as I had two kids who thought they would see him in the morning and I now had one more day on my own...groan!! My poor hubby was sent by USAirways to a dive of a hotel to sleep for a few hours and then he had to board a flight with connections (the original was non stop). He would be leaving at 7:30 am and would not arrive home till 10:00 pm. They had overbooked the flight and gave him no reason for bumping him. Needless to say he was not a happy camper and they have not heard the last of him. When we woke up this morning and went into the kids room to get them I peeked in while Marc was behind me and said to them "I have a surprise for you, can you guess what it is?" Katie yells out "It's Valentine's Day again!!" This kid is too funny :) "No, Katie, it is better than that....DADDY is HOME!!" Marc came out from behind me and they both started screaming with happiness. The rest of the day was pure bliss; it was sooooo good to have him home. A special thank you to Justin who offered me adult conversation and helped me at bath time as I have a bad back and Marc usually bathes them. The following are a couple of pictures of Katie at a birthday party at a gym that she attended today. I actually deleted the best one by accident :( My dare devil of a daughter had a blast and here you will see her bouncing, sliding and the final picture is her being put on a trapeze bar and sailing across the room. Katie: "Mommy, what are we doing today?" Me: " Nana is coming over this morning to play with you while I take Ethan to his speech school and then we will go out to lunch.'" Katie: "What is speech school?" Me: "That is the school that Ethan goes to so he can learn how to speak as good as you do." Katie: "Oh, I see, thats good mommy! I want to talk to Ethan!" Me: "What will you talk to him about when he can talk back to you?" Katie: "I will talk to Ethan about feelings and Sesame Street"
Today we went up to the Palm Beach Zoo with Grandma for Dragonfest. This is an annual event that celebrates CNY. There were several of our FCC Families there as well as some other families with Chinese Children from the Palm Beach area. CNY is over a 15 day period and we will be celebrating on three seperate occasions. Next week we are going to our agency party about 4 hours northwest of us in Tampa. We had another great time today. After the martial arts demonstation and the Lion Dance(Katie was brave enough to feed the lion money this time) we were off to see the animals. The one animal that Katie really wanted to see was the elephant and they unfortunately did not have one at this zoo. We told a "little white lie" to her because she was so upset that we did not see one. We told her that the elephant was sleeping and that we could not wake him up as it would not be nice to do so. She gave us what we call; "the look". Believe me when I tell you that you have never seen such disgust in one child's eyes as Katie's when she is giving "the look". We have told family and friends about "it" and when they get "it" they know they have been on the receiving end of "the look". There is no mistaking it. Ethan is still a bit under the weather with the remnanats of a cold but the two of them had a wonderful time running through the water in the almost 85 degree heat. You gotta love February in South Florida. We decided that it was time to go as we felt a rain storm coming on and we told them that we needed to get going. There was "the look" again...but we changed them into clean clothes and off we went. Within minutes they were both asleep. When we got home we found a package waiting for the kiddos from Aunt Shirley. I have mentioned Aunt Shirley on my blog before but for those who do not know of her she is Marc's aunt on his dad's side and she is abolutely, positively in love with our children. We have given her the honorary position of their third grandma. She is also an amazing knitter and she has made the most beautiful items for both children. This package held more wonderful handmade goodies for Valentines day as well as a few store bought ones. There was an exquisite wool purse for Katie as well as a stuffed yellow bunny for Ethan with a heart on the front which symolizes both his repaired heart condition and the love that the family holds for our son within their hearts. How amazing is that!! She also sent Dora Slippers fot Katie which she has not taken off. She is calling them her "slipperies". They also received a book, a huge package of M&Ms and two huge pencils. Thank you from all of us Aunt Shirley. We can't wait to see you again! The New Year’s greeting in Cantonese is Kung Hey Fat Choy, which means Congratulations and Be Prosperous. 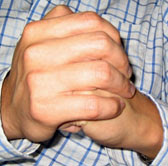 When the New Year’s greeting is said, there is a specific hand gesture. Here’s a picture of the correct hand gesture made for the Chinese New Year. The head of our agency for Katie told me that…Xin nian kuai le means Happy New Year in Mandarin, and is normally said to a young person. Xin nian jian kang is normally said to an elderly person. Xin nian hao is normally said to someone you don’t know on the street. Gong xi fa cai can also be said for the New Year. We had a wonderful New Year Celebration. Our local FCC Chapter holds an annual event at a wonderful and very authentic Chinese Restaurant on South Beach that one of our member families owns. They always provide the Lion Dancers and fireworks to be set off right after the Lion dancers are done....such fun!! Katie was not too thrilled; in fact she was downright upset by the "loud and scary" lion dancers but Ethan was VERY excited to say the least. He wanted to feed the lions money and got to do that 3 times and each time the lion came too close he scolded them very loudly. After it was all over he clapped and squealed with excitement. Should these two subjects be in the same post? Probably not but I need to balance the good and the bad. We have really been struck down again with some nasty bug. I was first. Marc is still fighting it and now Ethan is the new victim. He was really quiet all day and did not want to eat much at all. During dinner he got this weird look on his face and he made a funny noise and I told Marc...here he goes; he is gonna vomit and then wammo..he did! As he is doing it Marc says...that's interesting. I am like what?!? Never heard it described as that before. I find it anything but interesting. Dinner promptly ended for everyone at that point...eeew! BTW, guess what dinner was? Chef Boyardee Spaghetti and meatballs. I was cleaning out my closet and going through the hurricane supplies and found a family size can that was almost to expiration. I don't think any of us want to eat the rest of it....would you? Last night was a breeze; much easier that we could have ever dreamed it to be. We informed Katie Starr about an hour before bedtime that we had forgotten the blanket, pillow and baby doll at Grandma's house. She initially acted like it was no big deal; hardly batted an eyelash. Once bedtime came I thought the proverbial S*** was gonna hit the fan when she got into bed and asked us where everything was a "where is my blankey??" We reminded her where it was and she insisted that it was not at her grandparents house but it was instead in her dresser and looked at us like we were stupid not to have thought of that ourselves. We told her it was not there and she got up and rummaged through the drawers. We then explained to her that Daddy would pick it up tomorrow but for tonight she would use her Dora Blanket and Calliou doll that she loves a lot. She said that was fine and then unbeliveably she reached into the dresser and pulled out another soft pink blanket that she has always rejected in the past and said that this one was now her "new favorite" Huh?!? OK, whatever works! She then proceeded to lay down and went down with no problem and was fine all night. Today, Marc went up to his mom and dad's and retreived all of Katie's things and when she saw them she was very happy. I decided to tempt fate and throw them in the washer right before bed to see if we could have a repeat performance of last night and she was fine with that. She is happily snoozing as we speak with her new fav blanket. You would think that by now I would have learned a little something since I now have three children. Somehow I always forget that these milestones are usually scarier for the parents than for the children. Thanks for reminding me again Katie....doh!!! !